Tabu Ley Rochereau remains one of Africa’s most gifted musicians and dancers. 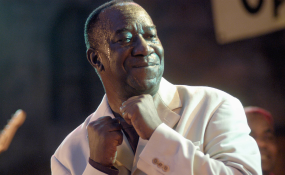 Exactly five years ago today, one of Africa's greatest musicians, Congolese crooner, composer and mercurial band leader, Tabu Ley Rochereau, passed on, leaving an enviable musical legacy and a rich discography. He was one of the continent's greatest singers and entertainers, and an accomplished dancer in his own right. Like his compatriot and arch-rival, the grandmaster, Franco Luambo Makiadi, Tabu Ley died in a Belgian hospital in November 2013 after a long illness. Franco had passed on in 1989, ending a competition that yielded great music over three decades, and a collaborative album, Franco & Rochereau, which contains hits like Lisanga ya Banganga and Ngungi. Tabu Ley's legacy lives on in his many excellent compositions. Fans and his fellow musicians worldwide will today and tomorrow stage shows in various clubs, hotels and other venues to mark the anniversary of his death. Not to be left behind in this celebration of a true icon of African music will be TV and radio stations in the DRC, Kenya and other African countries, which will also dedicate time to rhumba shows in memory of the crooner. The highlight of the celebrations will be in Kinshasa, DRC, where members of his former band, Afrisa International, led by Mekanisi Modero, will this evening stage a special tribute show at the Grand Hotel. Mekanisi and fellow US-based countryman, Wawali Bonane, are spearheading the arrangements for the tribute show. The Afrisa International members are also just recovering from the news of the death of fellow singer Dodo Munoko, who was buried in the US about two weeks ago. At some point last month, it was feared that Dodo's death would disrupt the musicians' plans to travel to Kinshasa for the memorial show. Dodo, who joined Afrisa in 1985 from Zaiko Langa Langa, will be fondly remembered for his rhumba ballad, Nalingi Yo Linga Ngai. Speaking to the Nation from Kinshasa yesterday, Modero said they had been rehearsing for the tribute show since their arrival in DRC on Monday. "We will perform some of Tabu Ley's most popular classics from the 1950s to the 1990s," he said. Two former Afrisa solo guitarists, veteran Paris-based instrumentalists Dino Vangu and Kayen Madoka, who performed with the band at various times between 1980 and 1990, will add flavour to the concert. Also expect to thrill fans are two Paris-based former trumpeters, also formerly with Afrisa, Kabert Kabaesele Lumu and Valenine Ntumba. It was Kabert who composed the song, Wendenda, in Tshiluba, spoken by one of the biggest ethnic groups in the DRC. Many will recall Mbilia Bel's beautiful rendition of the song, when she starred in it alongside her mentor. According to Modero, she has also been rehearsing with the group, and is expected join them in tonight's show. Mbilia bel is expected to perform Yamba Ngai, Nakei Nairobi, and Nadina among the popular songs she recorded with the band. Legendary guitarist Guvano, and veteran singer Maika Munan, are also hose expected to take part in the tribute shows. Tabu Ley's classic discography of hits include Adio Tethe, Chrisitina, Mercillina, Sukaina, Sorozo, Maze and Muzina (a prayer that many danced to decades ago). Others are Savon Omo (a commercial for the detergent), Silikani, and Ibrahima. Tabu Ley began his music career with Grand Kalle's African Jazz. He would later form African Fiseta with guitar wizard Dr Nico Kasanda. Crooner Sam Mangawna made his debut as a singer alongside Tabu Ley in the mid-1960s before joined Franco's TP OK Jazz. where he recoded several popular songs. Koffi Olomide, Pepe Ndombe Opetum, and Papa Wemba, the last two deceased, are among the musicians who say they were inspired by Tabu Ley's singing style. Koffi Olomide has honoured Tabu Ley by redoing several of his popular songs, in the increasingly popular 'chante' sessions. One remarkable aspect of Tabu Ley's lifestyle was his large extended family with some 75 children from different, who now live in different nations across the world. Some of his children, such as Pegguy, Melody and Yossoupha, have taken up their own careers in music and done quite well. Meanwhile on Wednesday this week, it was the 20th anniversary of the death of another Congolese musician, the burly singer, composer and band leader Pepe Kalle Yampanya. Pepe who led the Empire Bakuba Band died of a heart attack on November 28, 1998 in Kinshasa. He is remembered for some of his big Soukous songs like "Roger Miller", "Moyibi" and "Cocktail". Some of which were duets with versatile singer Nyboma Mwandido and earlier with Madilu System.